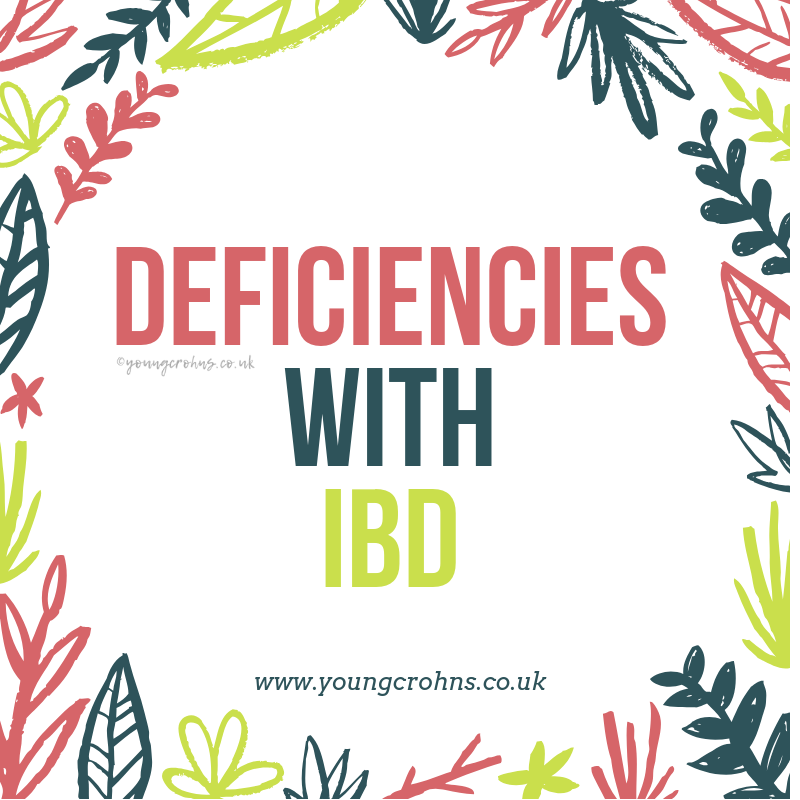 What deficiencies are common with IBD? When you have a digestive disorder, your gut does not function as it should; which means it has trouble absorbing all the necessary nutrients from the food you take in. For many people with IBD; they can become, overtime, deficient in particular vitamins and minerals. Vitamin A: Also known as Retinol; it helps your vision in dim light, your immune system fight against infections as well keeping your skin and linings of some part of the body healthy. Vitamin B’s: Included under this umbrella is Thiamin (vitamin B1), Riboflavin (vitamin B2), Niacin (vitamin B3), Vitamin B6, Biotin (vitamin B7), folic acid and Vitamin B12. They all have specific roles within the body, but all help how we absorb fats, proteins and carbohydrates into the body, as well as keeping our nervous system healthy. Vitamin C: Helps protects cells and keeps them healthy, aids the maintenance of healthy connective tissue as well as helping wound healing. Calcium: Is important for bone formation, as well as keeping bones healthy and strong. It also keeps teeth strong. Calcium is regulated by the presence of Vitamin D in the body, so having both is important as they are mutually beneficial. Iron: Helps create red blood cells, which help maintain the correct level of oxygen in the blood stream. Vitamin D: Helps regulate the level of Calcium in the body, as well as phosphate. It also plays a role in reducing inflammation and is important for good health and growth. Vitamin K: Is important for helping blood clotting as well as wound healing. Side note for those with an ostomy: Electrolyte imbalance and Vitamin B12 are high on the priority list here too. Vitamin B12 is explained in more detail here, whilst electrolyte imbalance is important because it helps to regulate the heart and neurological function, help maintain fluid balance and oxygen delivery. Restrictive diets – Whether you’re on a restrictive diet due to certain food setting off symptoms, being unable due to surgery, a flare up or just feeling to nauseous to actually eat can contribute to being limited to the foods in which essential vitamins and minerals are available in. Damaged intestinal tract / Inflammation – Vitamins and minerals are absorbed in the small intestine and having active inflammation or damage in that area can severally impact on how much is being absorbed, if any at all. Surgery – Resections of bowel, removal the terminal ileum and ostomy surgeries can impact on a) how much bowel is left for absorption to occur and b) if absorption can happen at all. Medications – Certain treatments for IBD can inhibit the absorption of nutrients or even cause them to be lost from the body. Diarrhoea – Watery stool – both intermittently and chronically – can reduce the absorption of vitamins and minerals also. What does this mean in the short-term and then in the long-term? In the short-term, deficiencies can give symptoms but this varies on the individual and their deficiency levels. For the majority, they go unheard of and thus not investigated unless flagged for another reason. In the long-term, being deficient can lead to other health issues; such as osteoporosis from calcium deficiency, chronic fatigue from vitamin B12 deficiency, anaemia from iron deficiency and loss of bone density from Vitamin D deficiency. How are they tested for how and can you increase them? Most of these deficiencies can be looked into with blood testing. Each vitamin has an optimum range for where a healthy person should lie between, and treatment will determined by the results from these individual blood tests. Most commonly, treatments include taking supplements for your particular deficiency/ies and/or increasing foods which are high in those vitamins and minerals. Your doctor – either GP or GI – should advise the best treatment if you have a deficiency. Usually, they will re-test your levels after a period of time – typically one month or three months – to determine if your treatment has worked. After this, it is important to maintain your levels, with foods that are rich in the vitamins and minerals you need. I’m currently deficient in Vitamin D and Vitamin B12. For my Vitamin D, I am on a three-month course of taking 3200 IU daily to raise my levels to an acceptable number. As each vitamin has a different optimum range, this is best determined by your doctors, either GP or GI, who will guide your food intake for the vitamin needed and dictate your treatment plan for raising the levels. Most GPs will give you information about how to best increase your level with food, but be aware that this is a general guide and you must consider your own personal circumstances too – ie what food can cause issues and how you digest your food best. My B12 levels will always go up and down as I have been receiving injections for this since my ostomy surgery, but recently, they have been moved from twelve weeks apart to now ten weeks, as my fatigue was severally impacting my quality of life. Ultimately, if you don’t discuss your symptoms with your doctor, they will not be aware of any changes that could be made. I’ve written about my Vitamin D here and my Vitamin B12 here. I will continue to discuss them as they either settle down or continue to be an issue, alone or with other problems ongoing. Are you deficient? How do you find out? Are you currently on medication or recently finished? Has it been recently reviewed / checked?